and it tells you to ap-get update to solve the problem, which is of little help, since that is what caused the problem in the first place! Don't forget to replace XYZ123 with the actual missing key. b2evolution 3.2 will be shipping with an enhanced twitter plugin based on Lee Turner's twitterlution. The twitter plugin for b2evolution allows to ping twitter in addition to other ping services. It will tweet the title of the new post and it's permalink url. The exact format of the tweets is configurable. By default it also includes a #b2p hash tag which will make it possible to follow all b2evolution bloggers who want to participate. The plugin can use a different twitter account for each blog. It can also use a different twitter account for each user. (If both are available, then the blog account will be used). 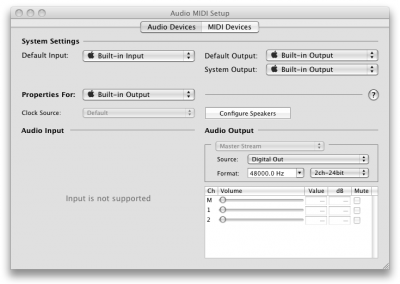 So your hooked up your Mac to your 5.1 receiver and all you get is lousy stereo? Worry no more, decent AC-3 support is finally available for Mac OSX! In my case I have an Intel Mac Mini from 2006 hooked up to a Denon AVR-3801 via a fiber optic S/PDIF connection. On most (fairly recent) macs, an SPDIF fiberoptic cable will be the best solution to get the digital 5.1 signal from your mac to your home theater equipment. Once you make that connection, there is one thing you should be able to do immeditately: play back DVDs in 5.1 Dolby Digital (or DTS or whatever surround track is on the DVD). If not, remove any DVD from the drive, then launch the DVD player app (not Front Row), go to Settings and tell it to output the DVD sound directly to the digital output instead of using the Mac Mini sound processing system. Now, what if you want to convert your DVDs to files on your terrabyte harddrive? (Private use copy is legal here but I can't tell you about your country). So for the video you'll probably use a divx or xvid codec and for the 5.1 audio you'll use an AC-3 codec... and package all that into a nice AVI file. Now in order to play that back on your mac, you need a bunch of codecs that are now conveniently packaged in a single downloadable package called Perian. 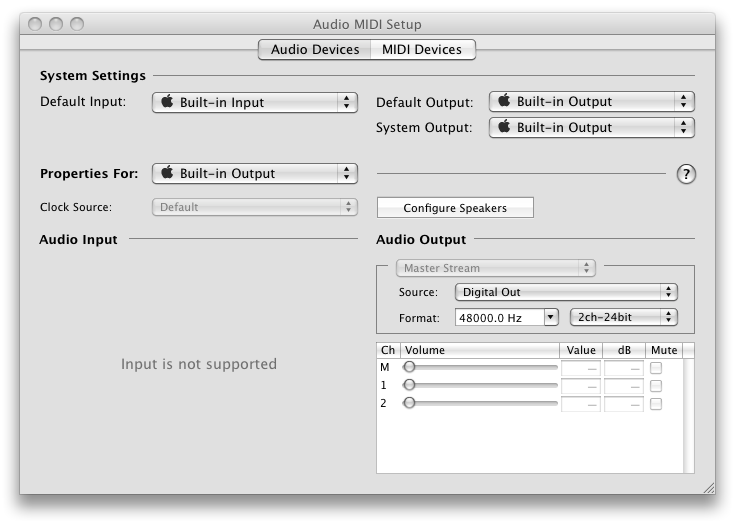 In order to do that you first need to go to your Applications/Utilities folder and launch the "Audio MIDI Setup" app. At the lower right, you want to set the Digital Out format to 48000.0 Hz. (See screenshot) That's the frequency used by AC3. Some say you also want to set it to 2ch-16bit but I haven't found this to be necessary so I leave it at 2ch-24bit. Updated for Mac OS X Mountain Lion 10.8.2. In order to get page up and page down to work properly under Mac OSX Terminal, as well as the home and end of line (EoL), you need to go to Preferences and then Keyboard and configure the right escape key sequences. In the Terminal Preferences, go to the Keyboard pane and watch the the keys named 'page up', 'page down', 'home' and 'end'. You will see they already exist but are configured to scroll the buffer rather than sending commands to the server you're connected to. In order to change this, double click on each of the relevant lines and select Action: "Send string to shell:"
You can either type these strings on your keyboard (start by presseing Esc) or you can just copy paste the strings from above. It is worth noting that some of these are already bound to Shift-Page Up, Shift-Page Down, Shift-Home and Shift-End (which are obtained with Shift-Fn-Up/Down/Left/Right on a laptop keyboard). So if you can change your habits slightly you don't actually need to reconfigure anything. If the recommended sequences don't work for you: please try the alternative suggested here. Also please let us know with which shell or editor you are trying to make them work and which escape sequences work best for you. This way we can order them in order of popularity and possibly give specific advice for specific environments to future visitors of this page. Thank you for your feedback. First cool thing that everybody knows already: Mac OSX is based on Unix so you get ssh out of the box. And next time you log into your mac and try to ssh somewhere, your private key will be loaded automagically (as long as your keychain is unlocked of course).